New Drug Could Curb Chronic Marijuana Use? Medical marijuana proponents have found countless ways that properties of the plant can be used to treat physical and mental conditions. With more funds being invested into treatment potential, more patients are being offered medical marijuana alternatives to pharmaceuticals. What about a drug to treat marijuana dependence? With all of the talk about the benefits of medical marijuana, many still see the drug as hazardous with the potential to create dependent and addicted users. According to research, a new medication may become available to induce a natural marijuana high, in effect curbing marijuana use. According to reports, medical researchers are developing a medication useful in replenishing the supply of a molecule that activates cannabinoid receptors in the brain. In addition to becoming an alternative to the use of marijuana, proponents of the drug say that it may also be an answer in relieving mood, anxiety, and other emotional disorders. A team of researchers at Vanderbilt argue that the drug could help marijuana users who are dependent on the drug. The research investigates the natural cannabinoid receptors in the brain in an attempt to recreate the high derived from the marijuana plant. The cannabinoid receptors in the brain are activated by natural compounds known as endocannnabinoids. According to the research, these receptors are turned on by THC, but could also be “turned on” using an alternative drug treatment. The drug was tested on a genetically modified mouse that had an impaired ability to produce endocannabinoids. The result was that the mice suffered from “anxiety-like” behaviors and even displayed symptoms of depression. Blocking the enzyme that normally breaks down 2-AG had the power to restore the supply of endocannabinoids in the brain. The powerful results, published in the online journal, Cell Reports, showed the symptoms of anxiety and depression were actually reversed in the mice. The research shows, not only that the drug can have the same effect as marijuana use, but offers the potential for further research into anxiety and depression. If those who suffer from anxiety and depression have low levels of endocannabinoids, the drug could “normalize” that deficiency, providing potential treatment options. The drug and the approach has not yet been tested in humans, so the effectiveness is not yet known, but it still offers a potential for those who suffer from these conditions or for those who are dependent on marijuana. 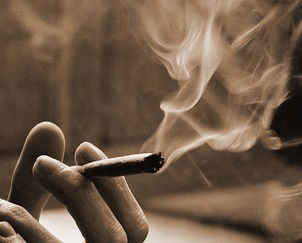 For many marijuana users, smoking pot can alleviate anxiety, depression and tension. Unfortunately, some researchers suggest that the chronic use of marijuana can actually increase anxiety overtime, resulting in dependency and addiction. Clinical trials of some drugs to curb marijuana use could be available in the next few years. Medical marijuana has been proven to alleviate symptoms of anxiety and depression. If you are a medical marijuana card holder in Southern California, it is important to know your rights. Our Orange County medical marijuana attorneys are dedicated to protecting the rights of users. In addition to helping distributors and dispensaries ensure compliance with California medical marijuana law, we can also help individuals who are under investigation or who have been charged with a marijuana crime.